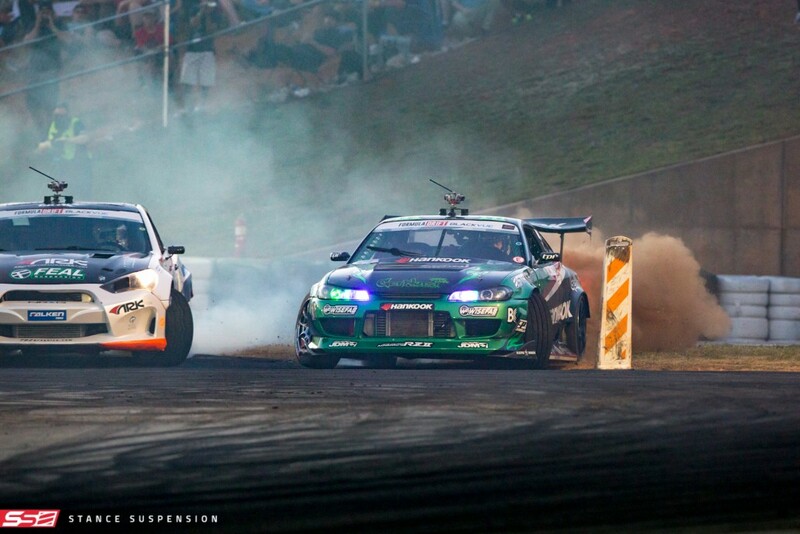 Road Atlanta is without a doubt one of the most beautiful tracks in the Formula Drift series. With its radical elevation changes, rumble strip lined edges and amphitheater-esque seating for the fans, this is a true race track. The Get Nuts Lab guys were fresh from their 3 day trek from Get Nuts HQ in Las Vegas, and the team was up bright and early to unpack everything and make the cars track ready. The Get Nuts Lab Team prep Forrest Wang’s car for Thursday Pro 1 practice. 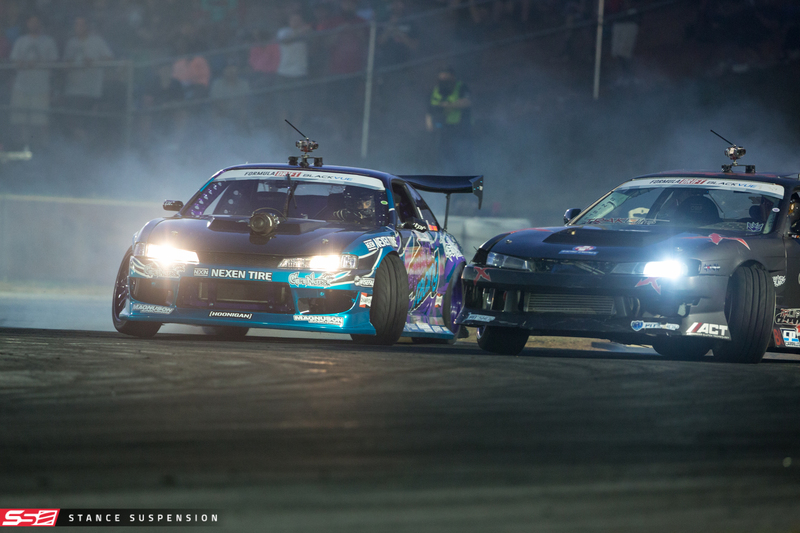 Mikey and Jeff of the Get Nuts Lab team verify their handiwork as they align Alec Hohnadell’s S14. Road Atlanta is also the first stop in the 2016 season for the Pro 2 competition. 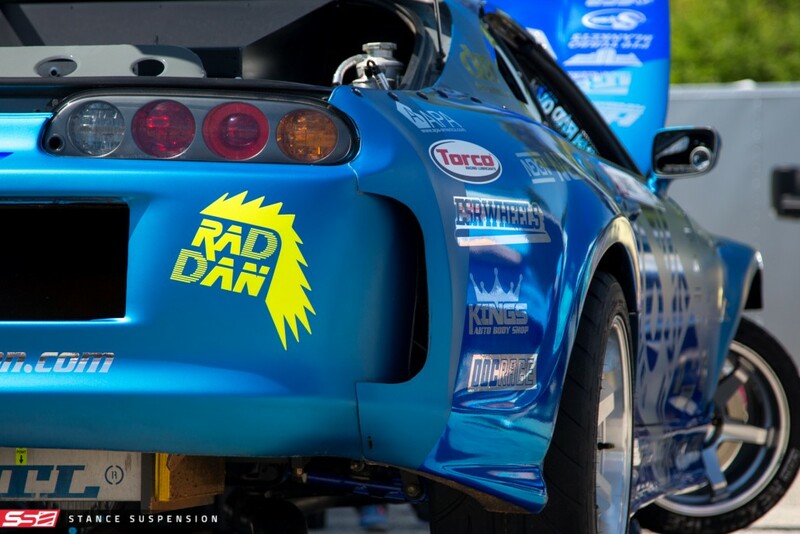 In it, we have a new addition to the Stance Suspension team; Rad Industries’ own Dan Burkett (find him on Instagram at @raddandrift). His revamped Mk4 Supra has a new look and new suspension to go with it, he will for sure be a threat to the podium this season! Dan is known for building awesome cars out of his shop Rad Industries and for his amazing mullet haircut straight from the 80s. 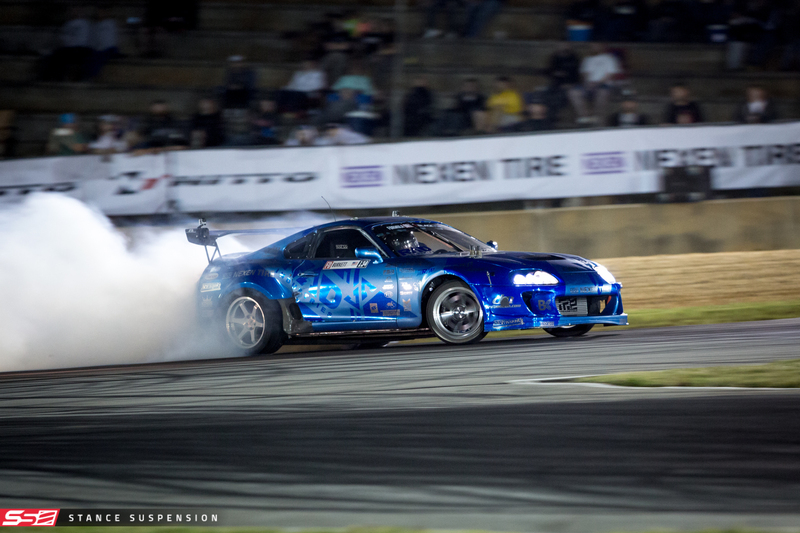 Dan’s Supra was built up to the highest caliber, trumping even some Pro 1 cars, with a custom (beautiful) cage and rear mount radiator among other custom fabrication work. This car is gorgeous. Dan is running a set of hand-valved D1 Spec custom coilovers that also feature custom spring rates from our friends over at Swift Springs! With a solid run of 80 points, Dan earned the number 4 spot for qualifying! Top 16 competition was to start on Friday for Pro 2. It was clear to see Alec’s confidence in his new chassis grow exponentially during Thursday and Friday practice and up to Pro 1 qualifying; he was looking just like his old self, if not more aggressive! He was throwing his car into each corner and was laying down some very impressive qualifying runs. He scored an 80 for qualifying and set his Top 32 matchup with Ryan Tuerck. Forrest drove as smooth as ever; insane angle and smoke followed by consistent runs. His qualifying score of 84 set him up with Jhonnathan Castro for his Top 32 battle. There was no safe place for the 2F Performance Super Doof bumpers on Alec’s car. RIP to all of the bumpers lost this weekend. Our guys are always busy at the Friday autograph signing. The lines were incredibly long, but the fans waited to meet their favorite drivers. 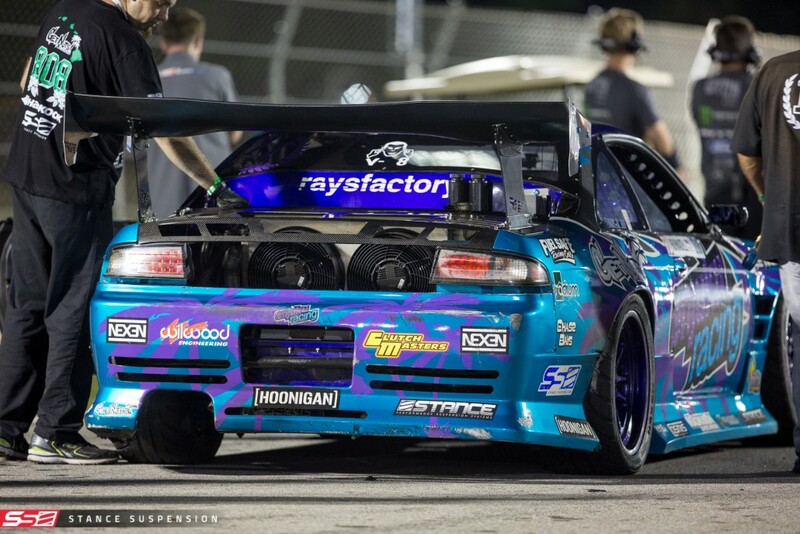 Dan was matched up with Ng Sheng Nian from Singapore in his JZX100. Dan threw down an impressive chase run and ran away with his lead run, which led to him advancing on to the Great 8. For his Great 8 matchup, Dan was bracketed up with 2016 rookie Andrew Lewis. Once again, Dan advanced on and moved on to the Final 4. His Final 4 matchup was veteran driver Marc Landreville. Dan put on a tough battle, but the ruling went to Landreville for the win. 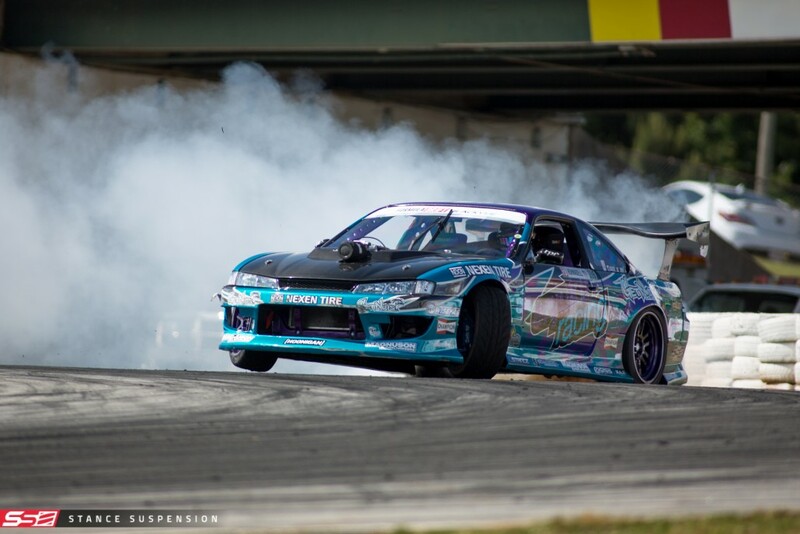 Dan secured 4th place at the first round of the 2016 Pro 2 season, the highest he had ever placed in his FD career! 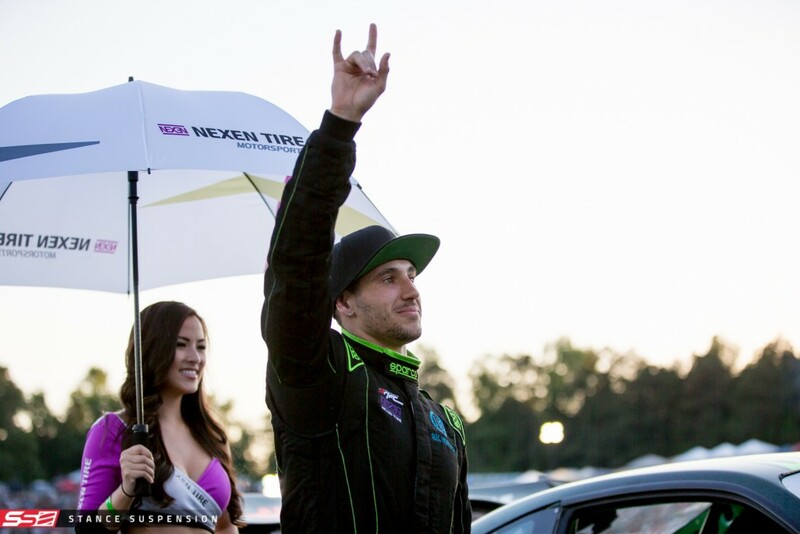 Without a doubt, he will be one of those drivers to watch closely this year as he and his Supra become even more dialed in. Looking forward to the season with you Dan! This matchup had already been seen today, as Wang and Castro practiced together prior on Friday. During that practice, Castro shaved off massive amounts of speed in the horseshoe causing Forrest to take a nasty hit to his front left corner directly to his wheel. No damage to the Advan wheel nor to any suspension components was sustained, which is definitely a testament to the quality! 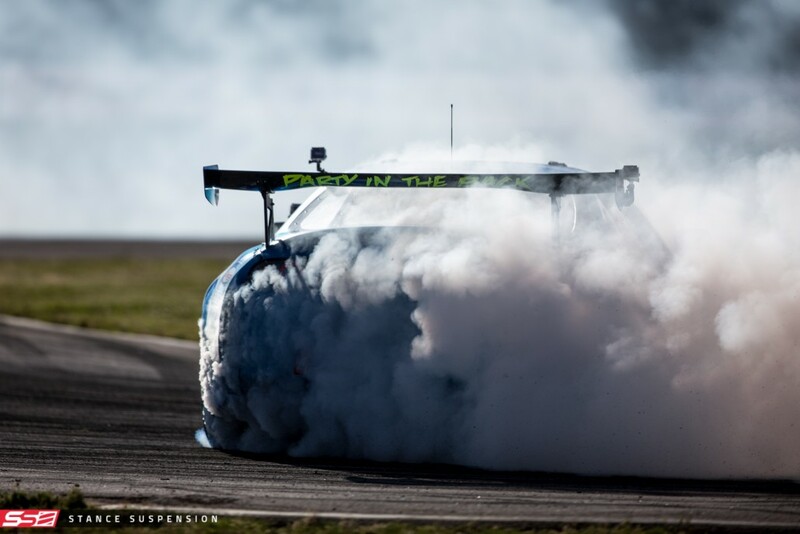 During actual competition, Forrest stayed true to his reputation, laying down tons of tire smoke and keeping the pressure on Castro. Forrest earned the win and progressed on to the Top 16. 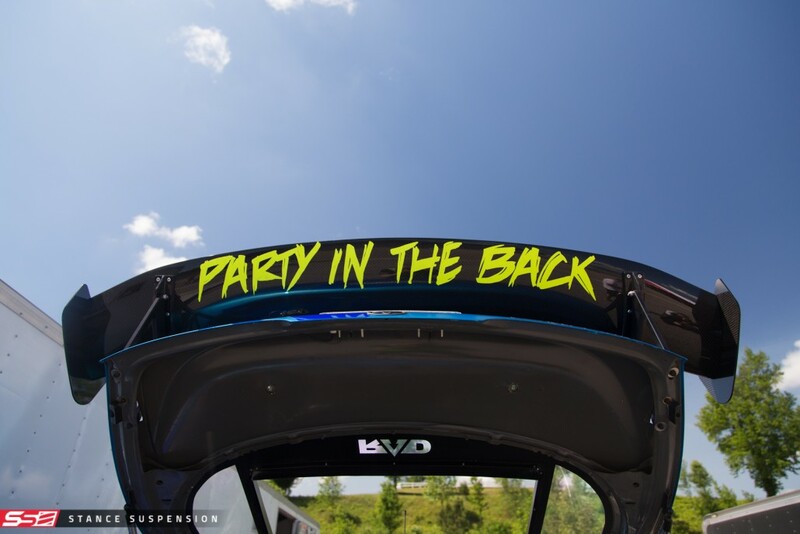 With his front bumper in tow under his car, Alec (Doof Slayer) was hot on Ryan Tuerck’s tail in the horseshoe section of the track. The pressure was applied, and the judges were going to have a tough call. Unfortunately, Tuerck was having differential issues after his second run against Hohnadell and that caused him to straighten. Alec progressed on to the Top 16. Forrest loves Road Atlanta, and Road Atlanta loves him! The crowd went wild with his announcement. 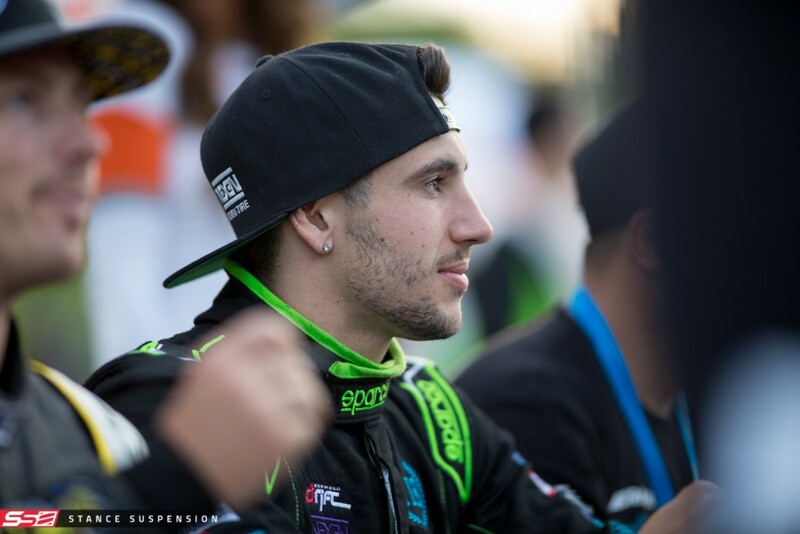 Although newer to the series, Alec has gained a following of loyal fans who love his humor, humility, positive attitude, and badass driving style. 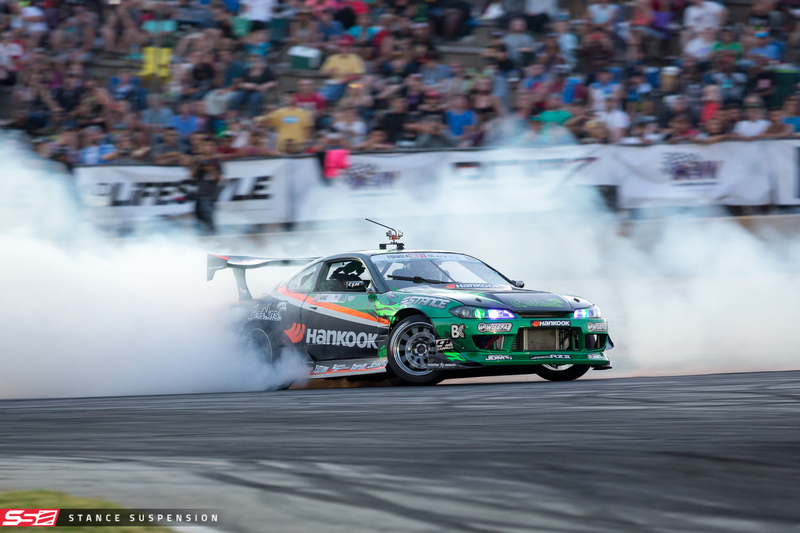 The Get Nuts Lab team is known for style and always putting on a show, so tandem drift donuts to hype up the crowd were a must. 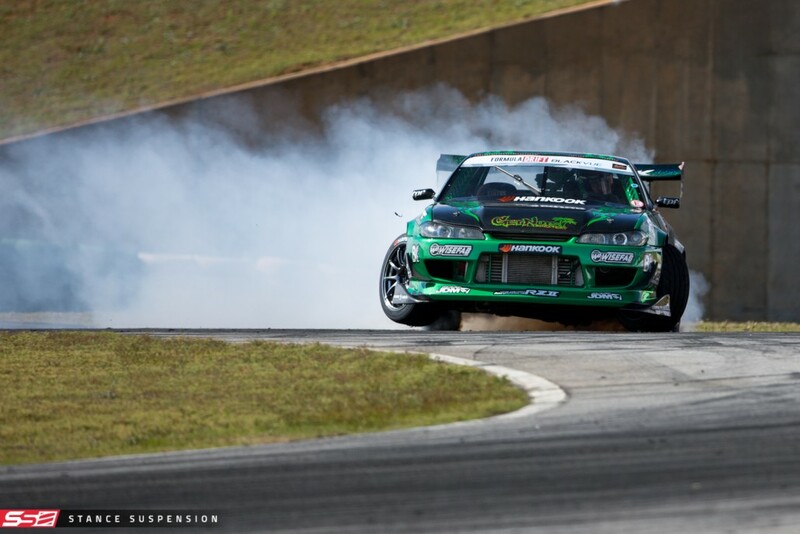 Forrest’s match up for Top 16 was the winner from last year’s Round 2 at Road Atlanta; Odi Bakchis. 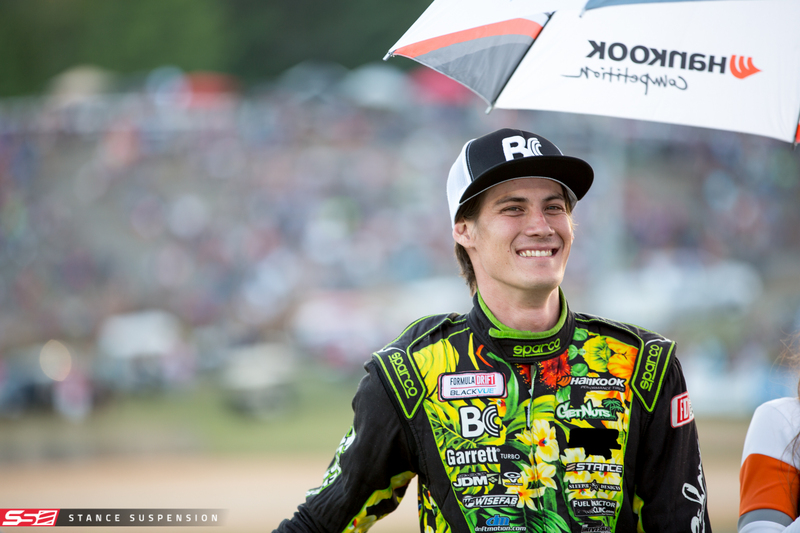 Forrest had a dirt drop at the top of the hill on his lead run, and Odi had four tires off and straightened on the same run, however Odi was given the win. Check out the run HERE and let us know what you think! Alec’s matchup for Top 16 was Jeff Jones, fresh from his Pro 2 win the previous day. Click HERE to view that battle! Hohnadell drove exceptionally, and was awarded the win over the JJR S14 and moved on to the Great 8 to battle Tanner Foust! The battle with Foust was tough but Alec had a clear and concise advantage over him on both runs, with more speed, angle and clipping point proximity. For sure one of the most exciting runs of this round, check that run out HERE. Alec advanced on to the Final 4 to battle it out with Dai Yoshihara. Alec’s Final 4 battle was no easy one; former FD champion Daijiro Yoshihara had been dialing his BRZ in for some time now, and through qualifying and all of the previous battles Dai has proven to be consistent and a viable threat. The battle could have gone either way however, as Alec had shown that he wasn’t there to settle. You can watch the battle HERE and see what you think! 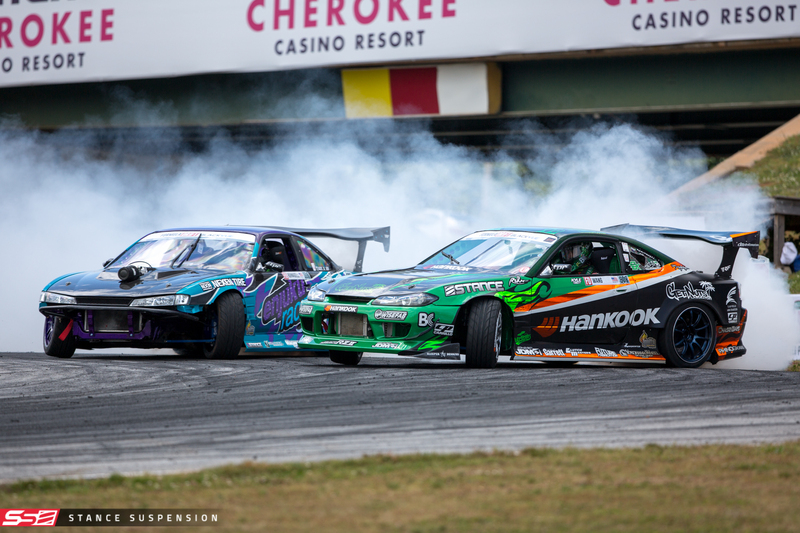 Alec gave the former champ run for his money, and Dai advanced on to the Final battle against Vaughn Gittin Jr.
That concludes our coverage of Round 2 of the Formula Drift series at Road Atlanta! Congratulations to all of our drivers!